I’m not a confectioner by any means, so I did have to follow another recipe for the marshmallows. Though, I did change it just a bit to suit my needs and with what I thought would make it a little easier. (Thank you Alton Brown of The Food Network, his original recipe can be found here.) It seemed intimidating at first, but the alchemic aspect of this project turned out to be such a treat. I felt like a scientist in my little kitchen. Chemistry and culinary lab-work aside, the finished treat is deceptively simple: a finger-friendly version of a wonderfully classic ice-cream flavor, well worth all the hard work. 1. Place the gelatin and 1/2 cup water into the bowl of the stand mixer with the whisk attachment installed. Set aside. 2. In a small saucepan, combine the remaining 1/2 cup water, sugar, corn syrup, and salt. Bring to a bubble over medium-high heat and continue to cook undisturbed (stirring will aerate the mixture and it can crystalize) until the mixture reaches a temperature of 240F. Immediately remove from heat. 3. Turn the stand mixer on low, and slowly pour hot sugar mixture down the side of the bowl into the gelatin. (If your saucepan does not have a pouring lip, transfer the sugar mixture to a large measuring cup first.) Once all the sugar has been added, increase the mixing speed to high, and continue to whip until the mixture is very thick and lukewarm (about 15 minutes). Add the vanilla during the last minute of whipping. 4. While the marshmallow is whipping, prepare the pan. Line a 9 x 13-inch baking pan with wax paper. Lightly spray it with non-stick cooking spray, then sprinkle with enough powdered sugar to completely cover the bottom and sides of pan. Shake out any excess sugar. 5. When the marshmallow mixture is ready, pour it into the prepared pan, using a lightly oiled spatula to help spread it evenly. Dust the top with powdered sugar. Allow to sit uncovered at room temperature for at least 6-8 hours (overnight is best) to set. 6. 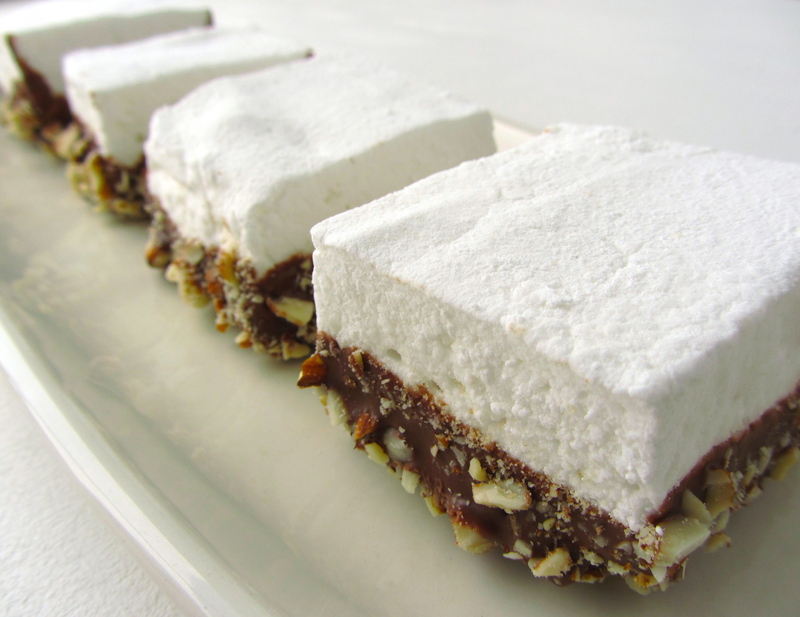 Turn the marshmallow out and cut into bars, about 2-inches square, using a large knife dusted in powdered sugar. Dust the cut sides of each marshmallow with powdered sugar. 7. Melt the chocolate, using a double boiler or in the microwave. Place the almonds into a shallow dish. Dip a marshmallow square about halfway into the chocolate, then press the bottom into the almonds. Place onto a tray lined with wax paper. Dip the rest of the marshmallows. Transfer entire tray into the refrigerator for 30 minutes to help the chocolate set. 8. Wasn’t that easy? Now go eat! * When it comes to candy-making, the secret to success is organization. Have all the ingredients and different stations for each stage ready before starting. * Find my tips on melting chocolate here.